We started Monday morning with a tour of Wedding, a neighborhood in Berlin that most of us had been pronouncing wrong since day one (it’s pronounced “vedding,” for the record). Josephine Apraku was our tour guide. She gives around three tours a month, as do others in her organization, and between them all, there’s a tour given every day. There never used to be this much interest in tours, but the demand has grown in recent years. 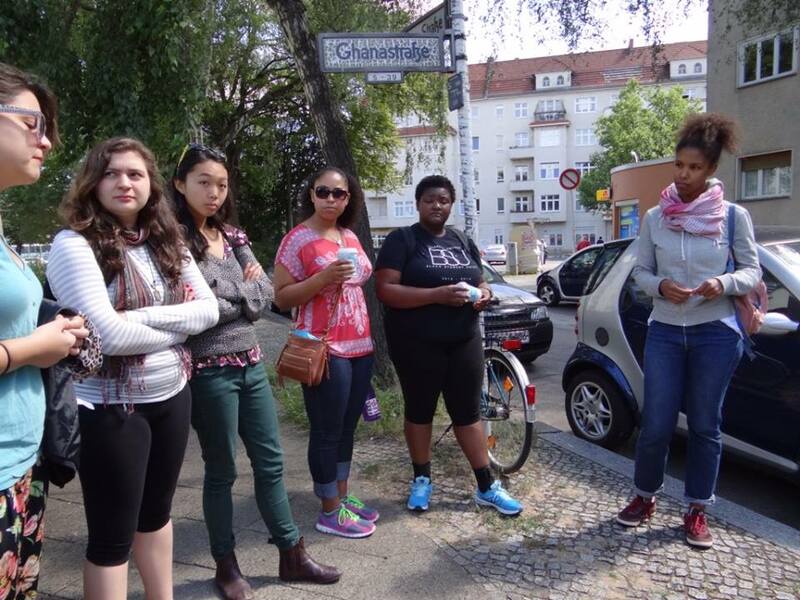 After a round of introductions, Josephine informed us that we were in the “African Quarter” of Berlin. Twenty thousand people with African passports live in Berlin, and many of them live here in Wedding. Many activists concerned with African migrants establish themselves in this neighborhood, as well. The neighborhood is a bit of a contradiction in and of itself. All of the streets were named in the context of German colonialism; although, many of them are named for African countries or regions. Some of the names seem innocent, such as Usambara, named after a mountain range in Tanzania. However, some names are more explicitly controversial. 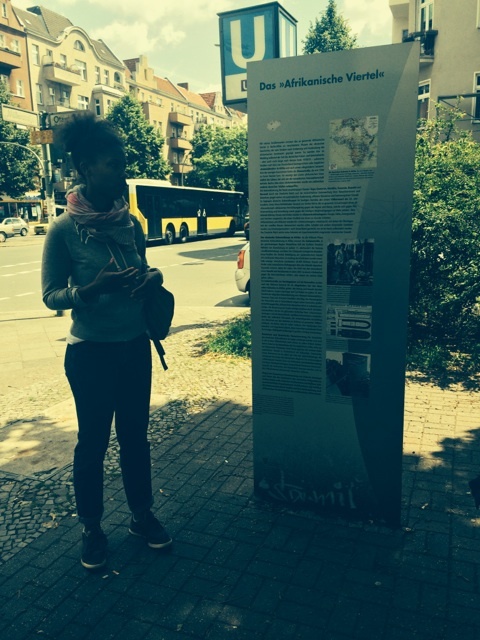 The street where we started our tour, Ghanastraße, is said to be the only street named for celebrating decolonization. We stopped at the intersection of Ghanastraße and Swakopmunder Straße, the latter of which is named after a small town by the sea where the Germans established their first concentration camp. We then moved on to Nachtigalplatz, a small park named after Gustav Nachtigal, a German doctor and historian. Nachtigal studied medicine, and then went to Tunisia to practice medicine. He wrote books on his travels and the people he met. For his time, the books he wrote were remarkably neutral and free of racism. He is now known more as a historian than a doctor. The park nearby Nachtigalplatz was named for a black zookeeper who survived the Second World War, and wanted to create a zoo to display humans from the German colonies. 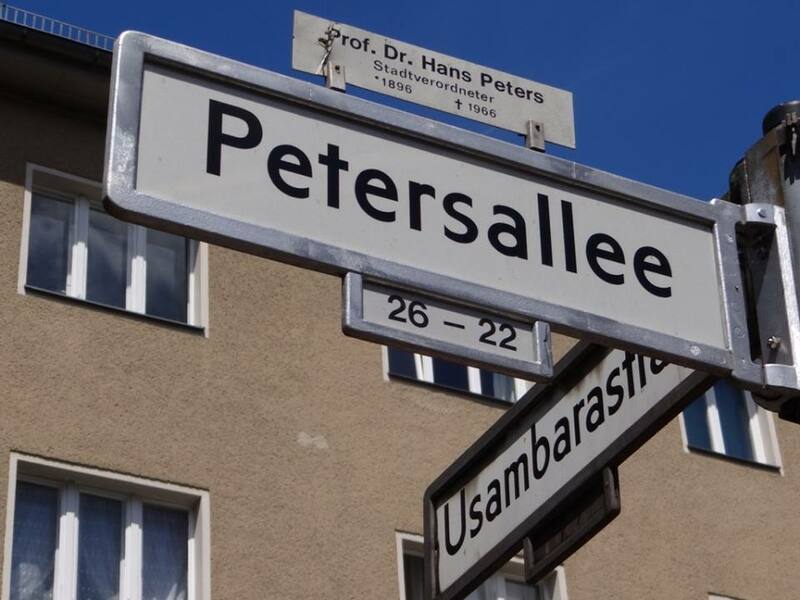 Petersallee is regarded as one of the most controversial street names in Wedding. It was named after Carl Peters, whom the Nazis regarded as an important man for German colonialism. He was known to walk around towns in Africa in colonial attire and to talk about his racist ideas and what he was trying to establish regarding German colonies. More notoriously, when Peters found out that one of his slaves had a relationship with another slave, he had them both executed and burned down the town where they lived. The street has not yet been renamed. Rather, the city found a new patron for the street, Hans Peters. There have been many attempts led by NGOs and other organizations to petition for a renaming of many of the streets in Wedding, especially a street our tour guide called M-Straße. In German, the M-word, mohr, is equivalent to the N-word in America. However, despite lawsuits and pressure, nothing is being done in the government to change the names of the streets. There is currently a law in place that says if a street was named during the Nazi era there must be a perspective shift regarding the history behind the street name. For instance, Hans Peters helped the Jews flee during the Nazi regime. In this case, there has been a slight perspective change but not quite enough. Some organizations are also arguing that more streets should be renamed after important women. A right wing group has argued that the names of the streets should not be changed for a few reasons. They say that no one knows the meaning behind the current names of the streets. They also say that Germans don’t go to Africa and change the names of their streets, so why should Africans get to come to Germany and rename German streets? This argument is simply laughable, especially because there are streets in former German colonies in Africa with German names. There is a fight to make this neighborhood an area of commemoration, but there are questions regarding whose stories should be remembered and shared and what should be commemorated. A sign that we came to at the end of the tour marks this struggle. The sign tells two stories about Germany’s relationship with Africa—one side was written by NGOs and the ISD and the other side by various political parties. Somewhat surprisingly, the two stories do not contradict each other too much, but they do reflect important differences regarding interpretations of Germany’s relationship with Africa. The sign, then, brought us to the end of the tour, and we headed to a restaurant for some wonderful Turkish food. 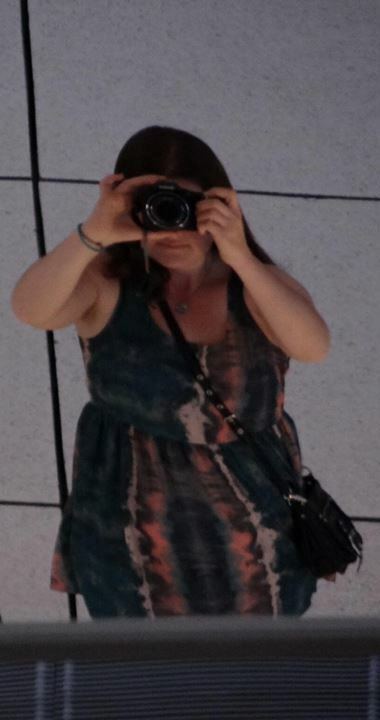 Blaise is a rising senior at Colorado College studying Biology and Feminist and Gender Studies. She likes road trips, coffee, and Harry Potter.